Water quality trading is a cost-effective way to meet clean water goals and deliver multiple benefits for people, fish, and wildlife. Yet, compared to other environmental markets (think: carbon offsets), interest and demand for water quality credit trading has been slow to catch on. A new report from the National Network on Water Quality Trading, “Breaking Down Barriers: Priority Actions for Advancing Water Quality Trading,” investigates what’s keeping water quality trading on the sidelines and proposes a detailed action agenda to help get water quality trading on the ground in more watersheds across the United States. Simplify water quality trading program design and application. Ensure state regulatory agencies have adequate capacity and resources to engage on water quality trading. Clarify each administration’s and the U.S. EPA’s position on water quality trading. Actively address real and perceived risks for buyers. Identify and address risks of litigation. Create guidance on trading for stormwater. Build stakeholder relationships and trust. This action agenda was developed based on a four-part demand assessment to understand the barriers that keep potential credit buyers from pursuing new trading programs or purchasing credits in existing markets. The National Network conducted the analysis to diagnose why, in contrast to other environmental markets, interest in water quality trading and demand for water quality credits has been slow, despite often being a more cost-effective way for wastewater and stormwater sectors to meet their regulatory requirements and deliver co-benefits to the community and the environment, as compared to traditional engineered treatment technology. 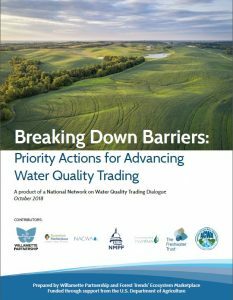 The suite of priority actions proposed in the National Network’s action agenda provide a path forward for proponents of trading to begin breaking down these barriers and advancing water quality markets in the United States.